A lot of my cooking is inspired by the really tasty things that I order in restaurants. I obviously can't eat out every night of the week, so sometimes I have to make up my own versions of my favourite dishes. This summery fennel salad was similar to one I tried in Polpo a couple of weeks ago and couldn't wait to try at home (nothing to do with fennel being cheap in Sainsbury's). The bitter tang of the fennel and sweet orange makes a very refreshing side dish that looks much more impressive than it should do, and it only takes a few minutes to knock up. Trim and roughly chop your fennel. Segment your orange. The easiest way to do this is to slice off each end of your orange and then carefully slice away the skin around the outside. Then you've got no white pith on your orange and splitting the orange into segments is simple. You can also slice it if you prefer, we're not the boss of your oranges. Mix up the lemon juice, mayonnaise, olive oil and black pepper. 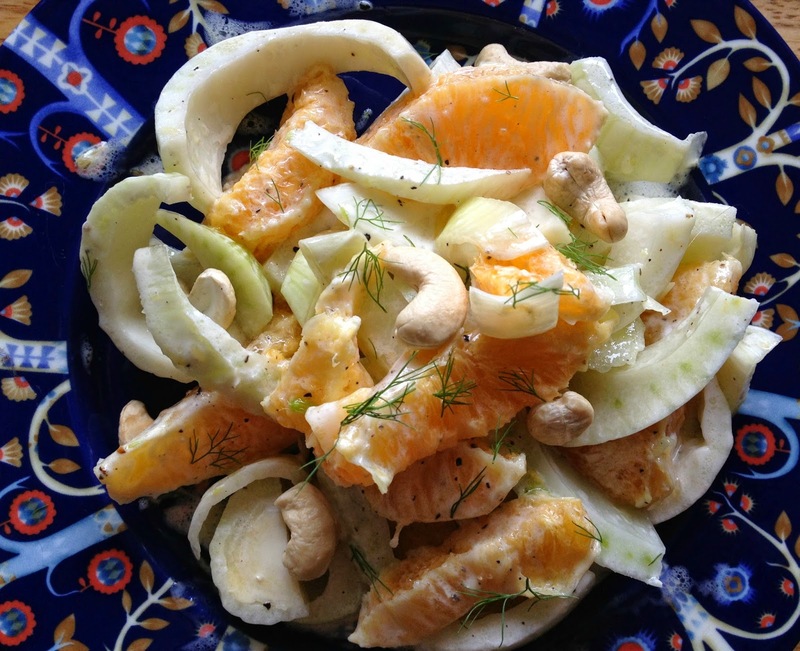 Toss your fennel and orange in the dressing. Sprinkle the cashews on top just before serving and garnish with the little fluffy fennel bits.